Follow all the Gonzaga women's action by following reporter Tom Clouse on Twitter. Everywhere she goes, she has the smile. Ask her about how her Gonzaga teammates played last weekend, Emma Wolfram smiles. Ask her about why she smiles all the time … well, yeah. “I guess it’s just my personality,” said the smiling redshirt freshman from Kamloops, British Columbia. She and all the other Gonzaga Bulldogs continue to live in the glow of the improbable upset of No. 3 seed Oregon State in Corvallis, Oregon, on Sunday to reach the Sweet 16. “It was awesome,” said the 6-foot-5 center, who came off the bench to lead the Zags with 17 points in the 76-64 win over the Pac-12 regular-season champions. She’s received several calls congratulating her on her performance, including from high school coaches and those from the Canadian national team. Asked how she felt afterwards when she had a chance to read about her exploits; or to watch replays of how she missed a shot over 6-6 Ruth Hamblin only to get her own rebound and then score the layup. Again, Wolfram smiled, and then talked about others. Now Gonzaga (26-7) takes on No. 2 seed Tennessee (29-5), which practically put women’s basketball on the map. Against No. 6 seed George Washington, senior forward Sunny Greinacher hit a 3-pointer with 3:15 left that turned out to be the winner in the 82-69 upset of the Colonials. Two nights later, Greinacher hit a jumper with 3:09 left after Oregon State had tied the game at 64. Gonzaga then scored the final 10 points of the game to upset the No. 10 Beavers 76-64. Asked what she thought the key was to those two victories, Greinacher said the team just had to play solid. Now the Bulldogs take on a Tennessee team that played 13 games against Top-25 teams and won nine of them. GU men’s coach Mark Few wasn’t the only one who attempted a handstand in the victorious locker room. But, women’s coach Lisa Fortier said her colleague performed better because of his Yoga. 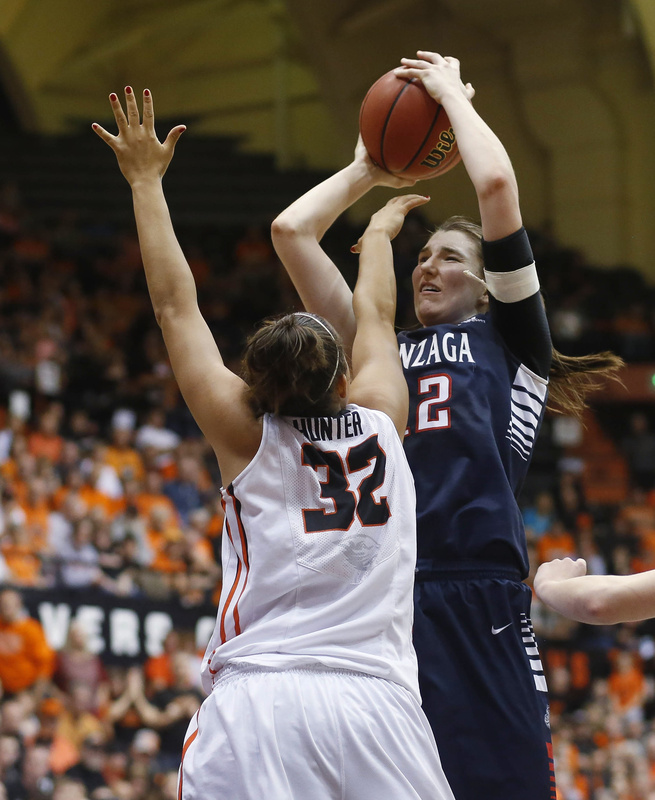 Fortier was asked if she was surprised that Gonzaga, which has the most wins (seven) as a double-digit seed in NCAA tournament history, upset both George Washington and Oregon State. Fortier had the team gather on Monday and they watched together as Tennessee beat No. 10 seed Pittsburgh 77-67. Fortier said she was impressed by the Volunteers’ athleticism.